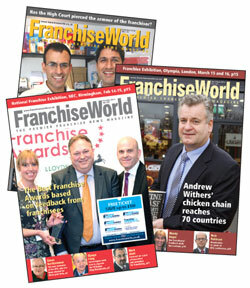 Franchise World, founded in 1978, is the longest-established magazine in its field and is acknowledged throughout the industry as the most newsworthy and authoritative. Covering both sectors of the industry, it offers the ideal medium both for franchisors actively recruiting franchisees and, on the other hand, for service and product suppliers targeting prospective and existing franchisors. Franchise World is distributed on subscription and free at all five BFA-supported franchise exhibitions in Birmingham (2), London (2), and Manchester, BFA Discovery days, and regular offers in the Daily Express. The magazine has an estimated readership of 12,000 of which over 75% are prospective franchisees. This directory is essential for newcomers to franchising, whether a prospective franchisee or franchisor. It lists more than 1,500 franchises now trading in Britain, and includes advisory articles by the leading franchise specialists in business consultancy, the law and the banks. To make it easy for readers to draw up a short list of franchises they would like to consider, the directory lists them by trade category and alphabetically. In addition to the advisory articles explaining every aspect of the franchise system, the directory contains specimen franchise contracts (including a master franchise agreement) and franchise glossary. Now in its 30th year, the directory is the most authoritative in its field.